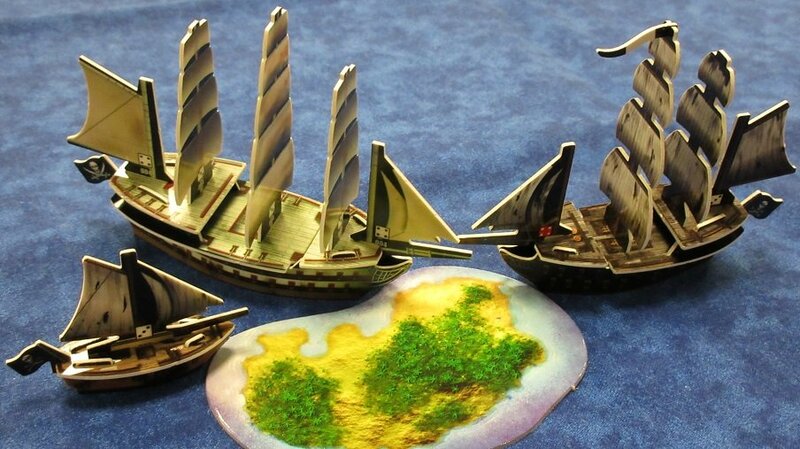 Pirates Constructible Strategy Game (CSG) is a collectible and constructible board game that was produced by Wizkids from 2004 to 2008, releasing 13 sets (or “expansions”) in a five year period. Topps (who owned Wizkids) shut the game down on November 10th 2008. Since then NECA (National Entertainment Collectibles Association) has bought Wizkids and the Pirates CSG product line from Topps, proceeding to make a cards-only version of the game. One game pack contains everything you need to play (hence the “Game in Every Pack!” slogan): two ships, an island, a card with treasure, and both the simple “Start Here” rules and the “Complete Game” rules. The packs originally sold for $3.99. Wizkids also began making Special Edition boxes and other releases such as Mega Packs and Scavenger Packs in later sets. The ships come “unpunched” in their cards. Punch them out and build them! Some ships are harder to build than others, but the Start Here rules have assembly pictures for each particular ship or hull type for that particular set. You can also punch out the islands, crew, and treasure, although some players keep their crew (especially named crew, the crew that have unique faces and flavor text) in the cards. Pirates is similar to a board game but without a board. This is one of the biggest appeals of the game – with no set path to go on like almost all other games have, you can sail wherever you want and do whatever you want! The game is extremely customizable, since you can play games as big or as small as you like. There are so many ships and crew that you’ll never run out of options when building fleets. Feel free to create a free account to participate in the Forum! If you’re new to the game, check out my Beginner’s Guide to get started.